Only for homes in the countryside or chalets in the mountains? No, no, no: the country style is suitable for all sorts of homes, even in the city, embodying an interior design trend that never fails to return to the fore. Simple, warm and inviting: these are the three adjectives that sum up this style, reminiscent of the US Midwest or an English cottage, recalling the rural landscapes of yesteryear and with an accent on harmony and relaxation. 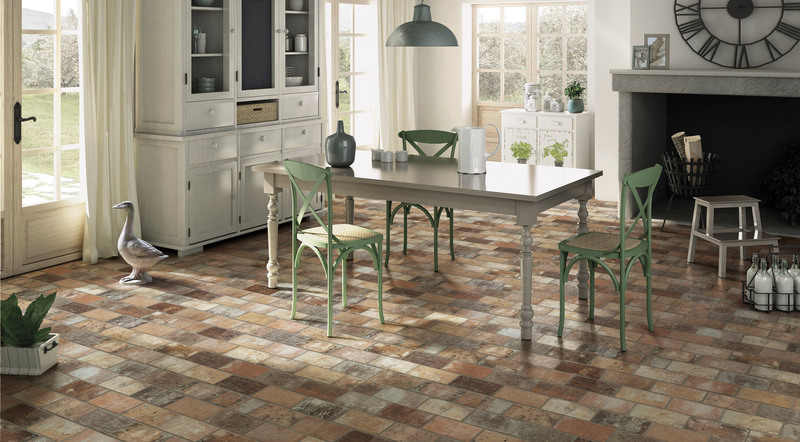 The key to bringing these idyllic country-style atmospheres into your home is to choose materials and textures with a natural, comfortable appearance, and cotto tiles are unbeatable for this. With their simple, refined elegance, they make for a beautiful covering solution, thanks to the shaded nuances and the aged look. Pure, subtle and welcoming, cotto is the ideal choice to create an exquisite country look in your home – but what about maintenance? This is where our Tuscany collection comes in. This porcelain stoneware series offers a perfect imitation of the nuances of cotto at its most authentic, and of the “wrinkles” that define the surfaces aged by the passing of time. Available in a wide variety of sizes for versatile laying options, Tuscany teams the finest ceramic tradition with the technical qualities of stoneware: impermeable, easy to clean and resistant to tread, wear and tear and chemical agents. The ace up its sleeve? The 20.3x20.3 Giotto decoration, splendidly reminiscent of the classic cementine tiles and suitable for use on both floors and walls. On our journey through country style, we can’t fail to mention the open brickwork look, a decorative architectural element that instantly brings a striking country allure. So pack your bags, we’re off to London! The brick-effect collection captures the attention instantly, thanks to the craftsmanship process and the imperfections of the glazes reflected on the porcelain stoneware surfaces. Available in the 6x25 size for walls, the collection is ideal to bring a country touch to the walls, such as around the fireplace in the photo, an element that conveys an immediate rural allure. Also very pleasant, for anyone seeking to obtain this look, is the brick effect on the floor, ideal for recreating the atmosphere of an English cottage. As you’ll have realised, in addition to simple materials with a natural inspiration, country style is based on a clearly defined colour palette: warm tones (red, terracotta and brown) are a must, instantly recalling old rural farmhouses and creating the perfect backdrop to shape interiors with a cosy, familiar, 100% country mood. In the photo, for example, the dusty shades with a brick effect from the Bristol collection (in the colour Rust) team perfectly with the metallic nuances of the Rust series on the floor (in the colour Coal), creating a perfect combination of country style and elegant, inviting finishes. Sturdy furniture, simple lines and rustic details will take care of the rest.